Room Information : Gran Hotel Guadalpin Banús has 181 exclusive rooms, decorated with noble materials and luxury finishings, and offers splendid views of the Mediterranean Sea in an atmosphere of privacy and rest. Elegantly designed Double Rooms and Junior Suites, equipped with the latest technology: plasma televisions, hi-fi systems, temperature regulators, mini-bars, safes and so on. The intelligent design allows the suites to have an adjoining room, whereby it is possible to create a single private and roomy suite in which even the terraces can be connected, if you so wish. The penthouse suites also have a bright sun deck facing the Mediterranean where you can enjoy a relaxing bath in your own private jacuzzi. Enjoying the suites and rooms of the Gran Hotel Guadalpin Banús will be an incomparable experience, combined with the exceptional five-star service which characterizes us. Travel Information : How to reach Gran Hotel Guadalpin Banús from Málaga Gran Hotel Guadalpin Banús is located at km 173 on the road A7 (the old CN340), a few metres from Puerto Banús and San Pedro de Alcántara, next to the beach. To reach the hotel, read the following instructions: Take the road A7 towards Algeciras – Cádiz, and access the Toll motorway AP7 when you arrive to Fuengirola. Merge onto AP7 towards Algeciras – Cádiz and drive for the next 40 minutes. Once in Marbella, keep on driving towards Algeciras on the highway A7. Go on direction Nueva Andalucía – San Pedro de Alcántara, leaving aside the Toll motorway. You will pass the Puerto Banús and arrive to San Pedro de Alcántara. At the first roundabout, change your direction back to Marbella – Málaga. On your way back to Marbella, go on driving 1 km following the directions to enter a Petrol Station. You will pass Ríu Rincón Andaluz and Cortijo Blanco hotels. Take the next exit to the petrol station on your right and go straight on down the road to the beach. You will find us at the end of that one on your right. Region Information : Motivated by the welldoing and success of the Guadalpin Marbella our team now invites you to enjoy this wonderful five star resort established in Nueva Andalucía with a prime beachfront location. Gran Hotel Guadalpin Banús is set in a privileged location, Its location makes it not only possible for guests to enjoy all the services the Gran Hotel Guadalpin Banús has available but also to benefit from the numerous possibilities in terms of activities and leisure that Marbella and its surroundings have to offer. The new hotel is only fifteen minutes walk from the centre of Puerto Banús, an enclave especially recognized as a destination for the elite and cosmopolitan. This pleasant walk passes boutiques from the best designers and gives you the chance to admire and contemplate the many ships and yachts. This could be a good opportunity to go sailing or test your abilities in a water sport. 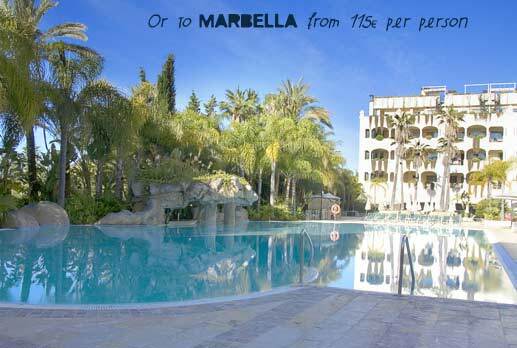 Only 6 km lie between you and the city of Marbella with its pictures historic quarters of cobblestone narrow streets and old churches, an ideal place to visit. Hotel Information : We offer you the chance to enjoy Guadalpin Spa at the Gran Hotel Guadalpin Marbella & Spa, using the free shuttle service running every 30 minutes. Health and beauty go hand in hand with Guadalpin Spa, a completely innovative spa over 1.200 m2 in size, with a magnificent dynamic swimming pool and four different sections: individual treatment booths, a water area, a thermal area and a relaxation area. If you wish, you can enjoy a relaxing massage by the sea and in the peace and quiet of your own room, at the hands of the Guadalpin Spa professionals. Our welfare facilities also include a Fitness Center and Cebado, the prestigious hairdressing firm. Pool Bar Sunbathing beside the sea Lovers of the sun, sea and the beach have an area set aside at Gran Hotel Guadalpin Banús. On the Hotel beach there is a magnificient Beach Club with refreshing cocktails and snacks. Similarly, Gran Hotel Guadalpin Banús has a large solarium with a heated outdoor swimming pool, a children's pool and a Pool Bar where you can enjoy a large variety of refreshing drinks as well as tropical fruit juices. And, for the more daring, our water sports centre Guadalpin Hollywood Watersports offers a wide range of sports and activities in the sea. Opening Hours: Season: 11:00 - 19:00 o'clock. Rest of the year: 11:00 - 17:00 o'clock. BEACH CLUB Free your senses... View: Rest your gaze on the horizon…on infinity; sense the immensity of a sunset. Smell: The smell of the sea, of nature at its most vivid. Sound: The murmur of the waves, the laughter of children, the happiness of those accompanying you. Touch: ink your hands into the fine sand, submerge your feet in the water, let your skin be caressed. Taste: Delight in the most refreshing drinks and the most appetizing snacks The Gran Hotel Guadalpin Banus is a sensational option for living the Costa del Sol experience in all its splendour. Opening Hours: Season: 11:00 - 19:00 o'clock. Rest of the year: 11:00 - 17:00 o'clock. Services available: - Deckchairs and parasols are at the disposal of our clients. - Courtesy towels. - Selection of drinks and snacks. - Personalised treatment and first-class service. Kids' Club: The smaller ones can enjoy a fun Kid’s Club offering a wide programme of activities in the presence of qualified staff. Guadalpin Hollywood watersports: All you need for fun filled days on the best coast of Europe with on average 320 days of sunshine per year and the beautiful coast line of the Mediterranean. Enjoy a relaxing flight parasailing along the Costa's, taking in the view of beach and Puerto Banus Spain's playground. Jetskis for adults and kids, hydro jets, even yacht charters, pedaloes and wake board are only some options. Golf: For those who prefer a challenging game of Golf, the area around Marbella has the highest number of golf courses in Europe with 27 golf courses close to the hotel and a total of 40 along the coast. The Golf Department offers hotel guests special rates on most of these courses as well as the possibility of booking a tee-off time, golf classes and obtaining advice. The Golf Department offers hotel guests special rates on most of these courses as well as the possibility of booking a tee-off time, golf classes and obtaining advice. Short description : Enjoy our Spa & Golf Breaks including Delicious Buffet Breakfast in Lorea Restaurant overviewing the Mediterranean Sea, 2 Relaxing Thermal Circuit or 2 Greenfees, Complimentary Wireless Connection...all yeard around! 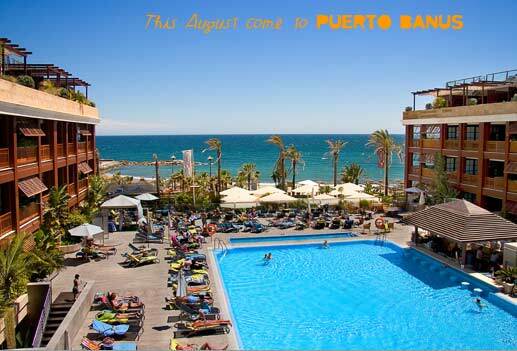 This new property is only fifteen minutes walk from Puerto Banus and right on the beachfront. This pleasant walk passes boutiques from the best designers and gives you the chance to admire and contemplate its exclusive marina. 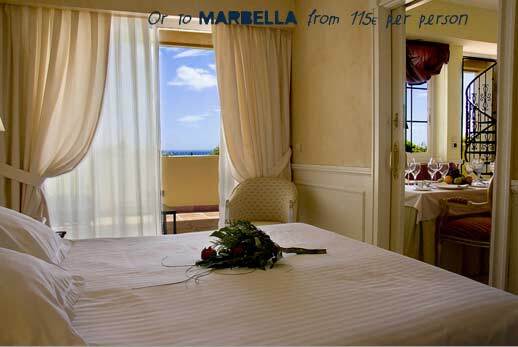 Only 6 km lie between you and the city of Marbella with its picturesque historic quarter of cobblestone narrow streets and old churches. 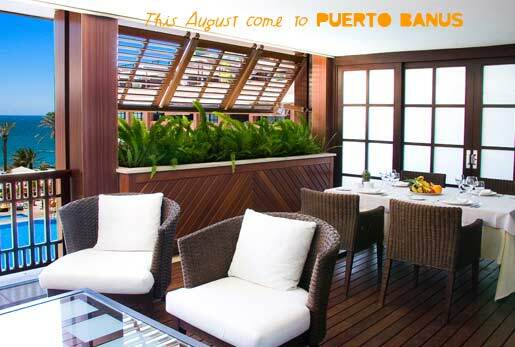 Whether alone or with others, the location of this new hotel will delight you during your stay in Puerto Banús. 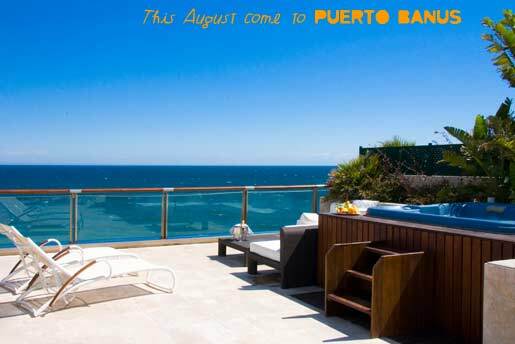 You will have the opportunity to experience the height of this very special enclave of the Costa del Sol with all its intensity, glamour, fun, modernity and sea, sea, sea... The hotel has 181 deluxe rooms & suites elegantly designed and outfitted with the latest in technology. All decorated with the finest materials, luxury finishes and set in a colonial scenery with splendid Mediterranean views. Cancelation Policy : Cancellation Policy: If cancelled up to 2 days before date of arrival, no fee will be charged. If cancelled later, the first night will be charged. In case of no-show, the first two nights will be charged. Children and Extra Bed Policy: All children are welcome. All children under 2 years stay free of charge for cots. All children from 2 to 12 years stay free of charge for extra beds. One older child or adult is charged EUR 53.50 per night and person in an extra bed. Maximum capacity of extra beds/babycots in a room is 1. Deposit Policy: No deposit will be charged. VAT and city/tourist taxes: VAT is included. Service charge is included. City/tourist tax is not applicable. Internet: Wireless internet is available in the entire hotel and is free of charge. Internet via TV is available in the hotel rooms only and charges are applicable. Meal Plan: Buffet breakfast is not included and cost EUR 16.05 per person. Parking: Secured parking is possible on site costs EUR 15.00 per day . Pets: Pets are not allowed. Important Information : Extra Beds only available on Deluxe Junior Suite and Superior Junior Suite. Cots are not available on standard double room.